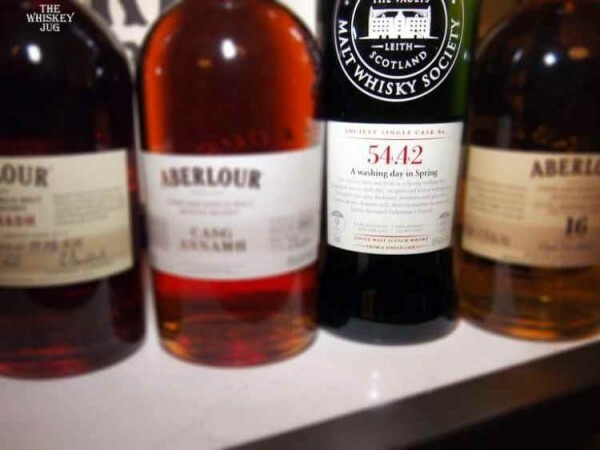 SMWS 54.42 “A washing day in Spring” is a single, first-fill ex-Bourbon, cask of Aberlour which we tasted at the Southern California Whiskey Club Aberlour event. 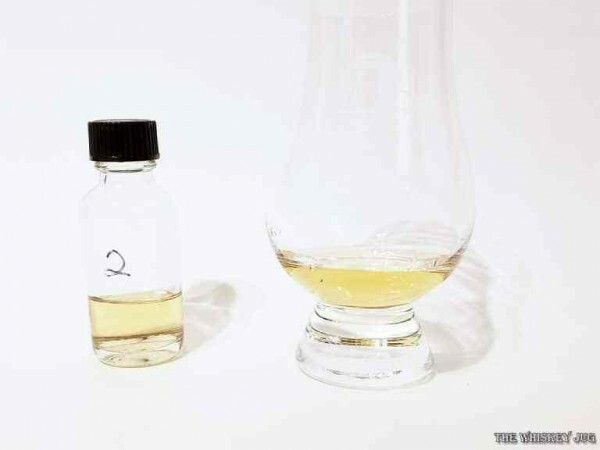 It was the second ex-bourbon whisky we had from the famously sherried distillery that night and I have to say… they should put out more ex-Bourbon whisky. Aberlour makes a great malt. And yes, ex-Sherry casks enhance that greatness, but ex-Bourbon casks put it on display. if you want to know what a distillery’s true character is get the whisky in an ex-Bourbon cask. It will give you a better sense of what they’re producing without sherry or other wine finishes changing it too much. The nose was clean and fresh as a Spring washing day – laundered sheets flapping on the line, daffodils and cut grass – lemon meringue pie, lemon and lime sorbet, Madeira cake and dry shavings of wood. All that citric freshness appeared on the palate – with good sweetness to balance (lemon drops, rhubarb rock, sponge cake, lime marmalade on toast); it also had lively wood spice heat and some zest and pith bitterness on the finish. The reduced nose stayed bright – lemon, honey and washing powder. The palate was young and vigorous, but full of taste – pineapple, oak and lemon-flavoured Fisherman’s Friends. Honey, pears, spice, roasted malt, melon and some bits of toffee and hay. Honey, pears, apricots, spice, dried apples, citrus, toffee, and candy sweetness with bits of graham and hay. 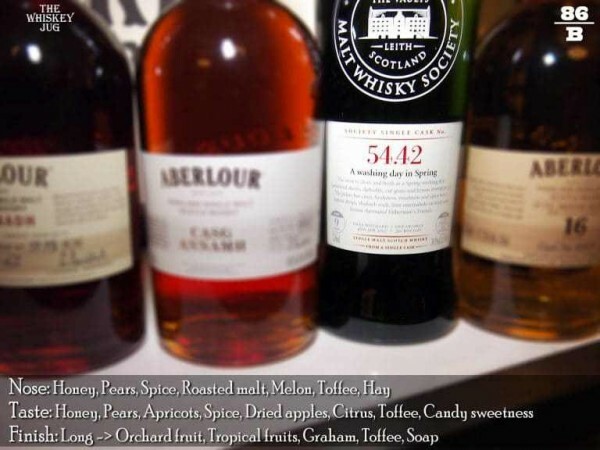 Long -> Orchard fruit, tropical fruits, graham and toffee that fades to soap. Good balance, full body and oily feel. I love the aroma and enjoy the palate but I can’t stand the finish on the SMWS 54.42 “A washing day in Spring”. The aroma is a warm and malt driven, the palate is warm and fruit driven, but that soap on the finish knocks the experience down a couple of spots for me. If it was a light soap I wouldn’t mind too much, but it’s quite aggressive, unfortunately. Still, it makes for a decent everyday dram that shows a different side of Aberlour. The big fruity notes and candy notes are interesting and lovely and water kicks all of that up a notch. With water, the aroma gets maltier and fruit sweetness jumps a bit, the palate gets fruitier and shows more notes of toffee. It also kicks up the soap more on the finish; if it wasn’t for that this would be a complex and buttery fruit bomb. 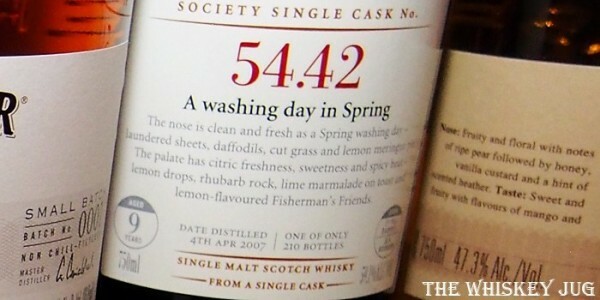 SMWS 54.42 “A washing day in Spring” is a tasty ex-Bourbon Aberlour. 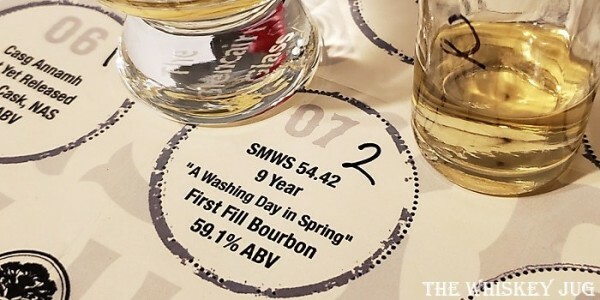 The post SMWS 54.42 “A washing day in Spring” Review appeared first on The Whiskey Jug.